"For if by one man's offence death reigned by one; much more they which receive abundance of grace and of the gift of righteousness shall reign in life by one, Jesus Christ." My Saturday didn't start out in the best of ways. I had been fighting sickness all week, and finally Saturday morning found me extremely ill. Imagine the uplift to my spirits when I went to the post office and found a package waiting there! with a return name and address that I recognized immediately. It was from our own dear Stephanie, the one who so faithfully puts this amazing Tea Cup & Mug Exchange together for all of us twice a year! My joy was full, even before I opened the box!! The lovely embellishments found on the outside filled my heart with hope and anticipation as to what was waiting when I peeked inside!!! I could hardly wait to get back home and open it all up with Kevin and Zach! Imagine the oohs and ahhs, right after Kevin cut through the tape to find all of this!! I didn't want to tear into them...they were so beautifully done. The wrapping alone was a gift all its own!! 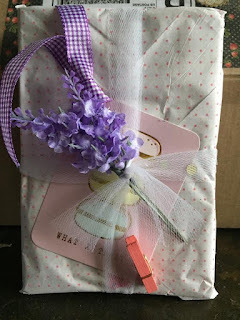 My favorite color in the world is lavender, and pink is a close second, so you can just imagine the excitement I felt as I gently lifted each carefully, thoughtfully wrapped gift from the box. You will never know how much you blessed me or how much you made my day!! This, dear friends, is what I found tucked inside the box. 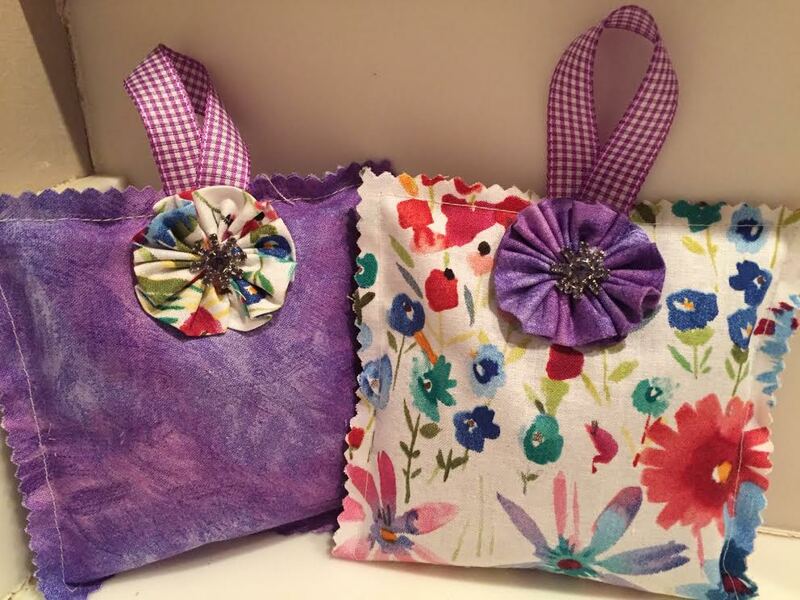 Two beautifully-scented gifts handmade by Stephanie's own loving hands. Aren't they the prettiest things? 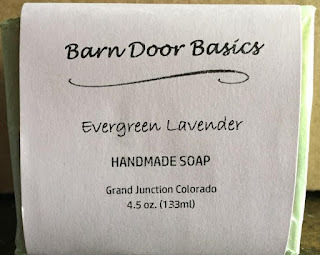 .An amazing bar of evergreen lavender soap! The sweetest, most dainty, little lavender bowl I have ever seen! I cannot get enough of this little bowl. I could sit and swoon over it for hours! I'm telling you, this bowl just calls to me....was made for me....I have no doubt. 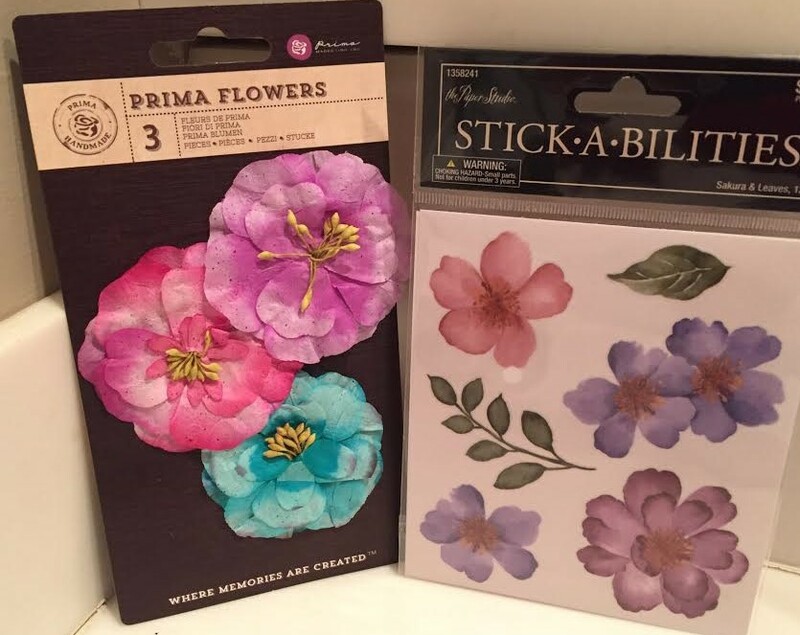 These are the most darling note cards! 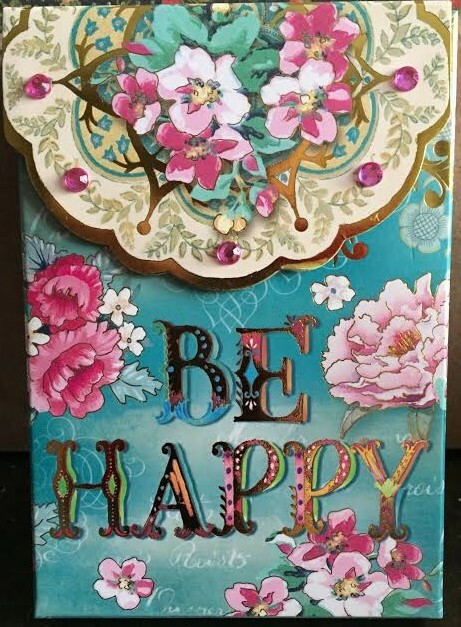 I love sending a card to brighten someone else's day...these are so colorful and perfect! 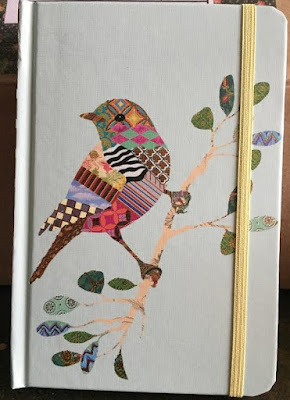 Then, I found the most adorable journal, with a sweet, little bird on the front. 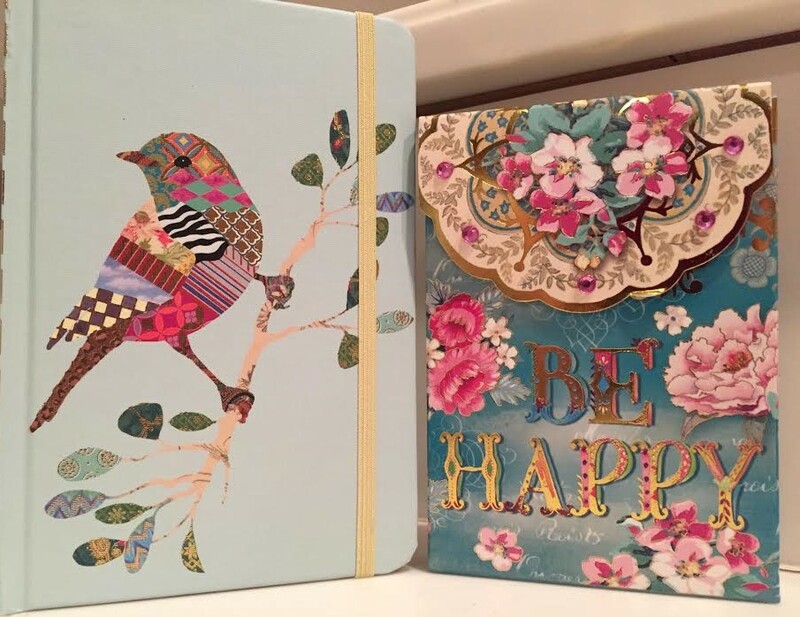 Don't the journal and the note cards look so pretty sitting side by side? And, guess what was hiding in yet another card tucked inside the bouquet card? Oh, my, I am just SO excited!!! An abundantly generous Starbucks gift card!!!!!!!!!!!!! Venti Iced Decaf Cafe Americano with extra cream and 2 packs of honey, here I come!!!! As I kept unwrapping, (I tell you, it felt like Christmas to me. It is a nice size and will hold a large portion of coffee or my homemade hot cocoa!! I can just picture steam rising from this beautiful mug, as I ponder on the grace of our Savior! I kept digging deeper into the box, and just look at what I found!!!!!!! 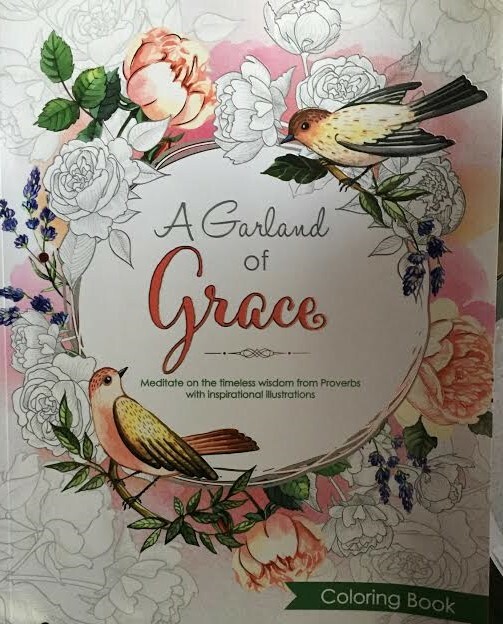 A beautiful coloring book, chock full of Scripture elements and oh, such lovely, pictures to color! Here's the back...can you read it? I find it so therapeutic and stress-relieving. Oh, the hours dear Zach and I have spent at the kitchen table coloring together in his coloring books! 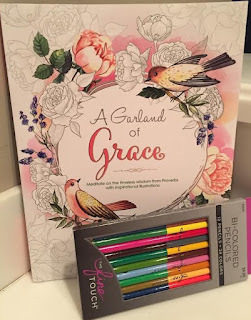 Then, a few months ago, my dear sister, Sandi, sent me my very first adult coloring book & pencils. I have SO enjoyed using it...and now, I have another one to choose from! I am so abundantly blessed. Sweet Stephanie thought of everything. She included some beautiful colored pencils, too! I love the name of the coloring book...a garland of grace! Isn't that God enshrouds each of us in? Grace, grace, God's grace, Grace that is greater than all our sin!" Where would be without His grace? After serving Jesus for many years, I think I am only beginning to catch a glimpse of the true meaning of GRACE. Oh, I do praise Him!!!! each time I use this book, drink from this mug, and use the many precious gifts she sent to me. And, now, for a group photo of my amazing, wonderful goodies, sent with so much love (you could FEEL the love while opening the box and gifts) from one of the sweetest ladies I know. It could not have arrived at a more opportune time. To God be the glory for such lovely, encouraging, caring friends and for the way He so graciously connects us through this blogging world. My life is so much richer by being a part of it. Again, I thank you, dear Stephanie from the bottom of my heart! To all of you precious readers, if you have never participated in Stephanie's tea cup and mug exchange, you truly do not know what you are missing! This is my third time participating, and it has just been a huge encouragement to me. I SO look forward to it, and I cannot even imagine how much energy and time Stephanie pours into it. Perhaps you have never met Stephanie or visited her blog? and while you are there, why not consider following, so you won't miss any of her wonderful posts? She also has an Etsy Shop called Rose Petal Blessings that is just amazing!!! 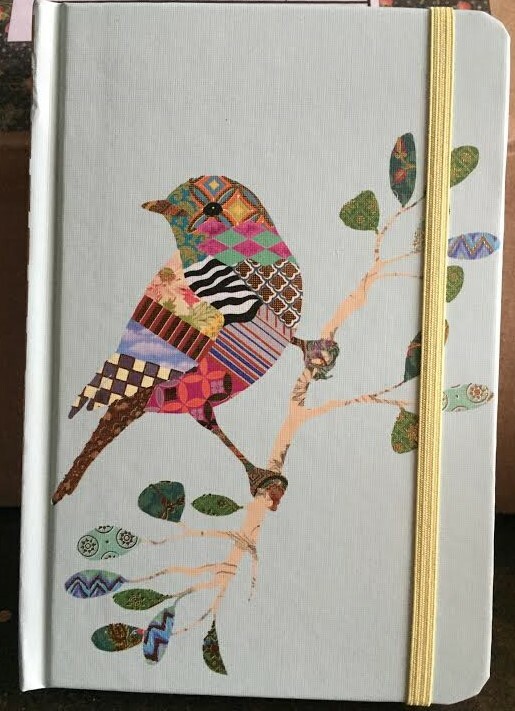 I have ordered from her multiple times, and her work is unique and impeccable. I often tell her that her creations should be sold in stores. You can see and feel how much love she pours into every, single thing she does. I hope you will stop by and visit her!! "Thank You, dear Jesus, for all of your abundant gifts. Thank You for such amazing friends. Thank You for suffering such an awful scourging to obtain the stripes needed for our healing. You, dear Lord, mean everything to me. How lovely. What thoughtful gifts our dear Stephanie sent you. I do enjoy this exchange! Oh, MY! I enjoy it so much, too...I am already looking forward to the next one! They can't come soon enough for me. Stephanie is one of the kindest, most thoughtful people I know. We are all so blessed to have her in our lives. What a gem! Sending love and hugs to you today from across the many miles, Elizabeth! Oh, I am SO thankful you were able to participate this time, Jill! YES, Stephanie surely is a sweetheart and dear blessing to know. So thankful to visit with you today, and I trust God will bless you abundantly! Precious friend, I am literally crying right now. Yes, I am a blubbering mess..... The kind and gracious way you presented the package I sent to you greatly touched my heart. You are such a dear, dear woman of God and it was my HONOR and JOY to send to you. 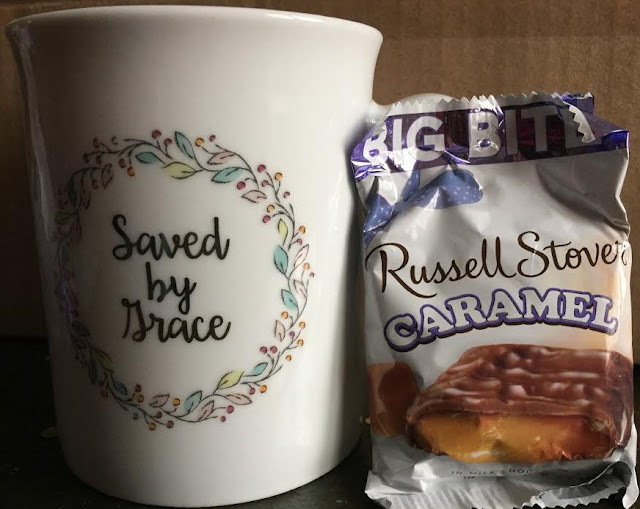 When I saw the mug I immediately thought of you because you share your gratitude for the grace God has bestowed upon us on a regular basis. And the coloring book was simply perfect as it, too, had the beloved word "Grace." Thank you, my friend, for blessing my life in so many ways. You are a precious gift from the Love. Much love to you! Oh, dear friend! You have touched my heart in so many ways! Truly, you are just precious, and I cannot thank you enough for ALL of the lovely gifts and the dear way you presented them and just EVERYTHING you do for all of us. I know God has a special reward waiting for you. I LOVED hearing the back story of when you were shopping for me...oh, HE knew how much I would LOVE the soap, and oh, my, that little dish...it just blesses and comforts me each time I look at it. It is PERFECT in every way. I love the scent of the soap, and it is not too strong...just perfect. I think of you every, single time I wash my hands with it. I love and appreciate you so much and trust God to bless you in a BIG way for all of your kindness to me. Cheryl, your deeply felt appreciation comes from your soul - you can "feel" it with this sweet reveal. THAT is what's it's all about it, isn't it? So wonderful. Stephanie is one special lady. Yes, that is surely what is all about, Michele! It is so nice to meet you today...and to find out that you are also from OH! It is always such joy to meet a fellow buckeye! Thank you so much for stopping by and looking at my treasures. God bless you! Stephanie sent you an incredible parcel of love. 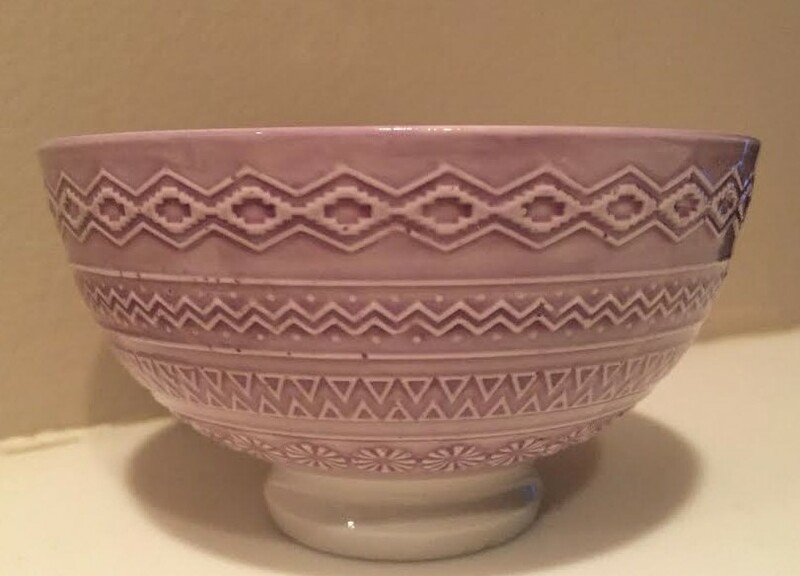 As a kindred spirit who likes purple, with pink as a close second I find your new bowl exquisite and the perfect place for a bar of soap or perhaps lavender buds in the summer? It was nice to visit you through the teacup/mug exchange. Oh, what a lovely idea to put lavender buds in that bowl! YES, I love that idea!!!! That is so neat that you love purple and pink...are there any colors anywhere that are prettier? If there are, I don't know of them. :) I am just so thankful for your visit today and am coming over to see you in a few minutes. God bless you, Judith! Wow! So many pretty things and I agree -- it would have been hard to unwrap them from those beautiful papers! I too received mine at a time when I had been sick and my hubby was facing surgery. It was such a stressful time and when the package arrived, I had forgotten about the exchange with all that was going on so it TOTALLY made my week! Oh, Lauren! I am so sorry to know that you have been ill and your dear husband had to have surgery. Are things better with you now? I truly trust so. Isn't it just like the dear Lord to allow the exchange to happen at a time that He knew you needed encouragement? He is SO faithful. I am so thankful for your sweet visit and am coming to visit you. God bless you!!! What wonderful treasures! This was my 3rd time in the exchange. I exchange only teacups. I always forget to photograph what I send out. I always do that! Cynthia is now a new friend and she sent me so many wonderful things. I am so blessed. It seems you are too. I love the reveal and getting to see what everyone gave and received! I love it, too! It is so much fun! Thank you for stopping by, Trisha! Hi Cheryl! I sure hope you are well on the mend now Cheryl. How awful to feel bad for a week! Imagine getting these gifts from Stephanie herself! I remember being a part of the exchange a few years ago, and it just blows my mind that it's been going on for 10 years! What a generous way to bring bloggers together. I love all the things you got, the mug with 'saved by grace' on it is so shiny and pretty! My favorite color is purple too, so I enjoyed the color palate as well! Oh, praise God, I am so much better. It has been so hard lately, but God is ever faithful! Oh, that is so wonderful that you were able to participate a few years ago. 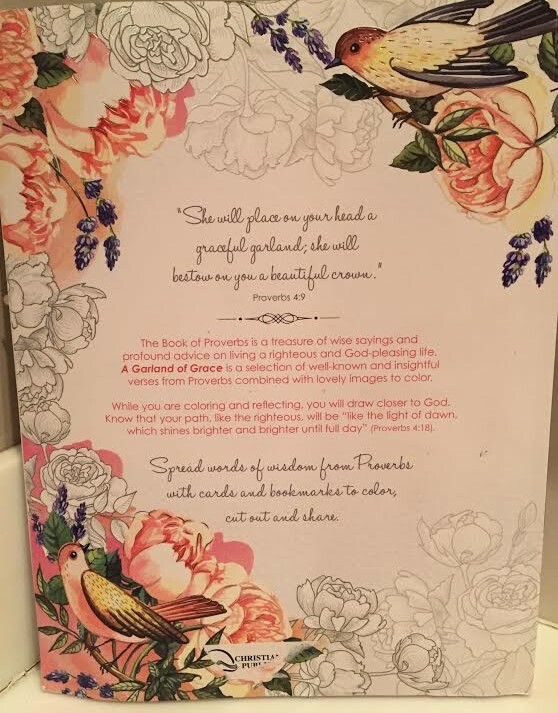 The dear Lord uses sweet Stephanie in such a wonderful way to introduce us to one another and to create this sense of fellowship in blogland. She is just a gem. As are you, my friend. Your encouragement and friendship means so much to me! God bless you!! 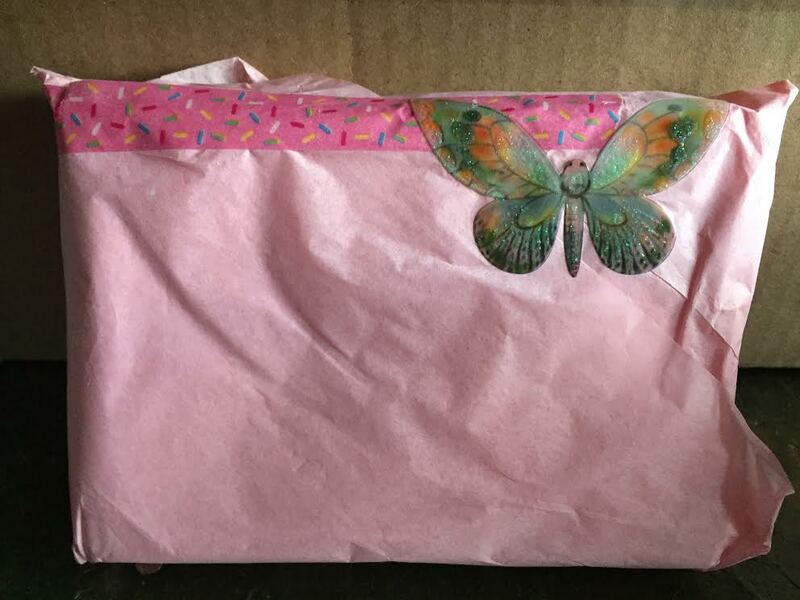 Stephanie is so good at picking out items to send to people and she did a wonderful job with your package. 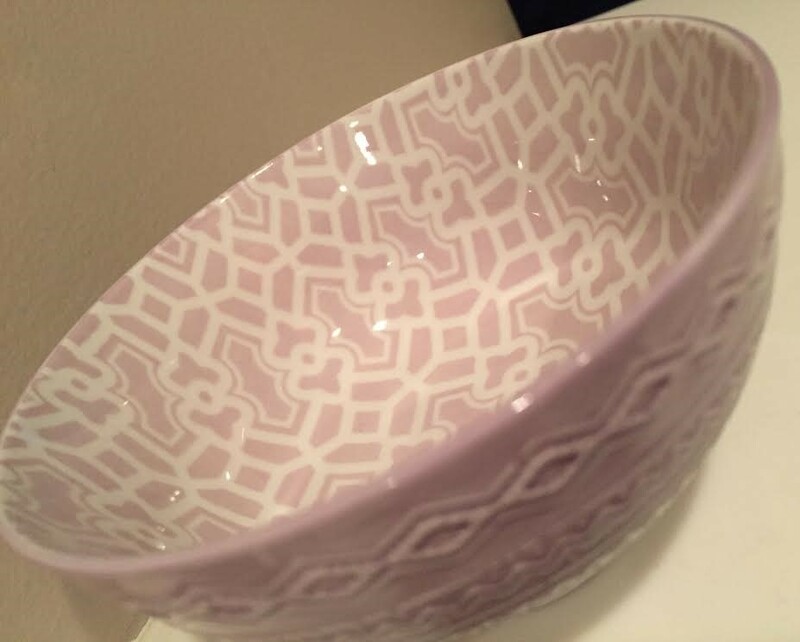 That bowl and soap really are super pretty. She surely did. Oh, my, I am just blessed each time I look at the pretty things she sent. I feel so grateful to the dear Lord and to her for bringing us all together like this. So happy to see you here today, Ida. God bless you!! What a fun and sweet gift exchange! How great God's Grace truly is towards us. I love the hymn that you posted also. I needed to hear it today so much--thank you for sharing it! I am drinking my tea from a beautiful mug, printed with Scripture, that was gifted to me also. Our Lord knows how to keep our hearts looking up to Him, doesn't He? Thank the Lord for Dear Sisters in His Body who stay open to hear His promptings! Bless you Dear Friend! Oh, how true! I am so happy the song ministered to you, sweet friend. How sweet that you were gifted a Scripture mug and are lifted by the Scripture each time you drink from it! Yes, He surely knows how to keep our eyes upon Him. You are such a dear friend and precious encouragement to me. I hope your pain is not so bad today. I am praying for you and sending you much love! 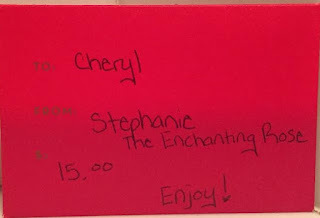 What a wonderful gift you have received from Stephanie! I also love that mug and the coloring book! 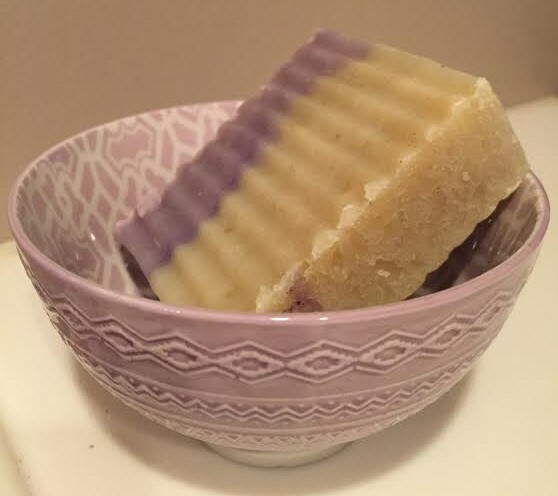 The soap looks so pretty in that dainty little dish! How precious! Stephanie's handmade items are so lovely! Handmade gifts from the heart are the best! Enjoy your goodies! Thank you so much, Linda! I agree with you that handmade gifts are the best! 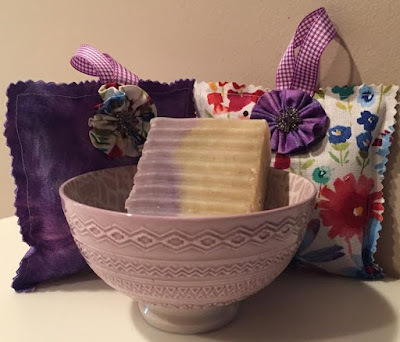 I thought the soap looks so pretty in the little dish, too. Stephanie is so kind and good to us all through her endless outreach and Christlike spirit. It was just so wonderful to see you had visited, Linda. God bless you abundantly! Praying that you are better soon. Thank you, Victor. God bless you, too! I could just feel your excitement, Cheryl, with every single word that you wrote!! You were certainly loved and blessed (and spoiled) but our sweet and kind friend, Stephanie. I know you will think of her each time you gaze upon and use your gifts with such delight. It's such fun to meet new friends through Stephanie's teacup/mug ministry, isn't it? Thank you for your kind visit to my blog. God bless you, too. YES, I was utterly spoiled! LOL! Oh, yes, it is so much fun to meet new friends. I was so thankful to meet you today! Thank you ever so much for stopping by and leaving such a sweet comment here, my new friend! The exchange is so much fun! Exciting to see the teacups and mugs everyone received ... each so different! Making new friends is a real treat. Oh, it surely is!! I so enjoyed seeing so many posts today of the lovely goodies they received and reading how many made new friends through the exchange. Thank you so much for stopping by here! God bless you! Yes, He surely has given her the gift of encouragement. She is just precious! Thank you so much for stopping by and leaving such a sweet comment. Lynn. God bless you! Dear Cheryl, this was truly a heart felt moving testimony of your love and gratitude towards all that my dear Stephanie has graced your life with. I could feel your thrill and excitement as I scrolled down through the photos of every item that was quite fitting for YOU. Your love for that dish is priceless and then to see how Stephanie came upon it as well as the soap, amazing. Isn't good wonderful!!! He knew just when you needed that parcel to arrive. I trust you are feeling better? Thank you for this up lifting, God honoring post of grace and gratitude. 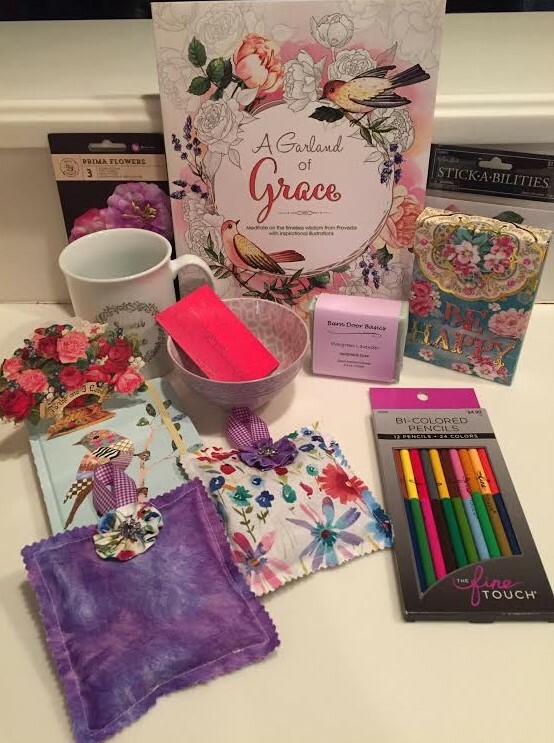 Thank you so much, sweet friend! Oh, that dish! It sits now on the little table beside my bed. I just love it so much! 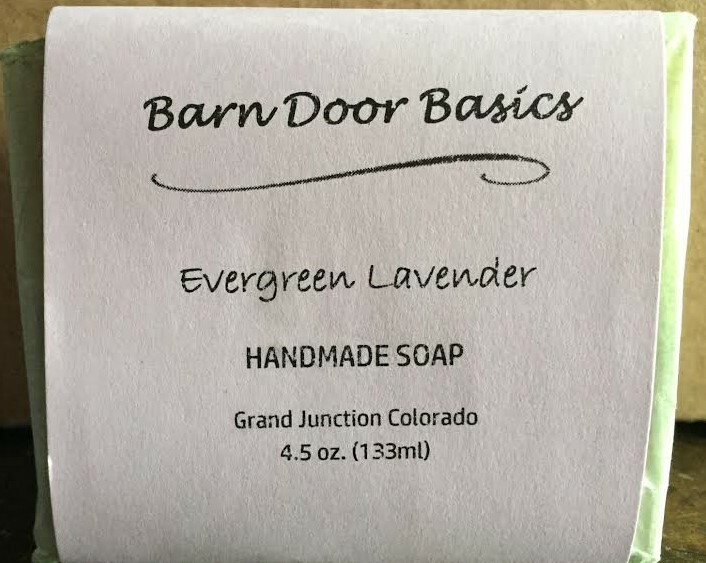 And soap??? Oh, my, soap is my obsession, I believe! Yes, the dear Lord is so wonderful, indeed, and He shines so brightly through dear Stephanie and through YOU, my dear friend! I so appreciate you both and praise God to walk this blogging journey alongside of both of you. What a blessing! Enjoy your weekend, and God bless you abundantly!!!! Oh, my! What lovely tea time delights!! 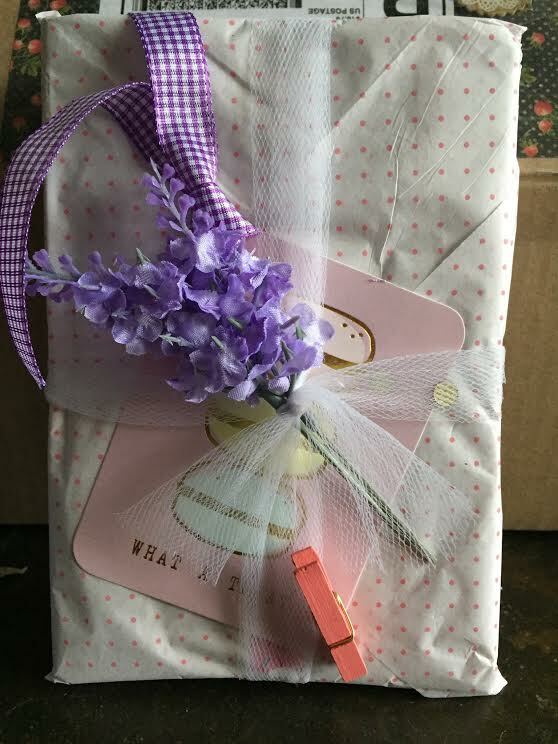 It has been so much fun to see everyone's beautiful packages! It surely has, Sarah! I have had a ball going around visiting different ones and seeing all of their blessings! So thankful for your sweet visit! Yes, indeed! God is SO good! Thank you so much for your visit, Nancy. Sending love and hugs to you today! YES, indeed! Thank you so much for your sweet visit and kind words, Stacey! Hi Cheryl - I am your newest follower. It's so nice to have met you. What a fun box of goodies you received. :) I also love coloring. I have several adult books, but...no time. ha, ha. Someday, they are there, waiting for me, though. I am sure you are enjoying everything you received, and am glad it made you feel better. Sorry you were sick. :( I am praying for you, still! Thank you, sweet friend. Your prayers just mean so much to me! I feel so much better, praise God. I could never thank Him enough for all He has done and is doing. He is so faithful. I am praying for you, too, and yes, there will come a day that you will have time to color. For now, enjoy those precious little ones. I hope all of you have a great weekend and that you feel well enough to get outside with them. Sending love and hugs and blessings your way! Spoiled indeed! I love it all so much, too!!! Thank you so much for your sweet visit and kind words. Sending many hugs and blessings back to you, sweet friend! How great to have sisters that care with not just words, but actions. Glad to hear it lifted your spirits and your body physically as well I think. My mom's favorite color is lavender. I'm not surprised. Special people! Royal ones! Oh, that is so sweet that your Mom's favorite color is lavender, Floyd! It was my dear mother's favorite color, too! I love what you said about special and royal! I never thought of it that way, but that was a kind thing to say. You are right...it is the little things that mean the most in life. God bless you abundantly, brother. I so appreciate your encouragement here. These look like wonderful gifts! Thank you for sharing their beauty with us. I hope you have a lovely day! Oh, thank you so much, dear Bethany! I hope you are enjoying your day, too, sweet friend! What a fantastic box of goodness. Love that you shared it with us. Real mail is so fun! Isn't it though? I love getting mail!! Have a blessed day, Tiffany!! I can only say these gifts were Holy Spirit inspired to inject happiness and laughter in the midst of your long week. Stephanie is a great friend from what I see. God bless her! God grant you strength and full, speedy recovery Cheryl. You are SO right! The precious Holy Spirit absolutely directed sweet Stephanie's steps when purchasing such appropriate, perfectly-fitting gifts! She surely is a great friend, as are you, dear sister. I so cherish your visits and kind words. Sending much love to you across the many miles! What you received are such wonderful goodies, you too have been blessed by the gift of Friendship, darling Cheryl, our beloved Stephanie is a tresure to so many ! Oh, how precious you are, dear Dany! You always encourage and uplift me greatly when you come by. I am so thankful you were able to participate, too, and your goodies were so lovely. God bless you abundantly, my dear, sweet friend! What lovely items! You presented them in such a heartfelt, uplifting way too. Oh, thank you, dear Susan! God bless you again and again! 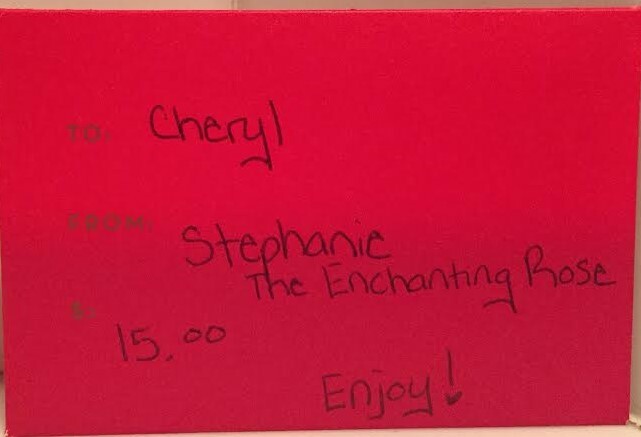 Oh, how neat that you have been the recipient of one of Stephanie's giveaways! I can surely relate to how much joy and blessing it brought to you! It surely did touch my heart in so many ways. Thank you ever so much for your sweet visit and encouragement, my sweet sister and friend. God bless you! I truly enjoyed getting to see what you received !the purple bowl is so lovely... This exchange has been so much fun and blessing ! Hope you have a blessed week! Oh, thank you so much, Shellie! It was such a fun exchange...you are so right. I am just so blessed by your sweet visit and kind words and will come visit you! God bless you abundantly!! Oh Dear Cheryl! What an incredible package of love sent to you! 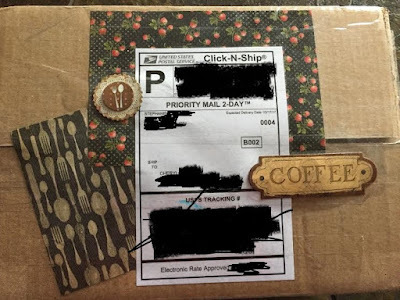 Oh my goodness, Stephanie is one of the most amazing givers ever, and I agree with you that the gift packaging is almost as fun as the gift itself! 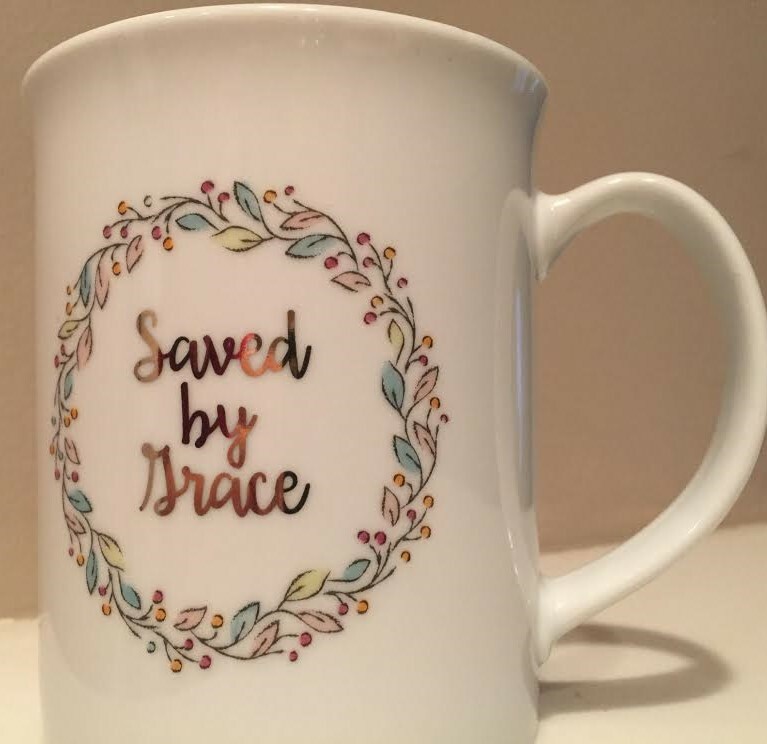 You will have many precious times with the Lord as you drink your coffee or hot chocolate out of your gorgeous Grace mug! And oh the lavender dish and soap go perfectly together! I'm so very happy for you dear Cheryl, to receive such a special gifting of love, you will enjoy it and be so blessed by each and every item. Isn't this exchange just wonderful! I love the joy that it brings to so many hearts. May the rich blessings of the Lord be with you my friend, I hope to send you an email very soon :) Hugs to you today! Oh, thank you, sweet friend!! I had such a ball opening it all...though I hated tearing up those beautiful packages! Stephanie's heart is so big and kind and filled with love! As is yours, my dear friend. Thank you ever so much for your dear, kind words and visit...you always lift my spirits so high when you stop by and leave your encouraging stamp here. May the dear Lord bless you. I so enjoyed your email and will answer as soon as I can, Lord willing. Love and appreciate you so much! 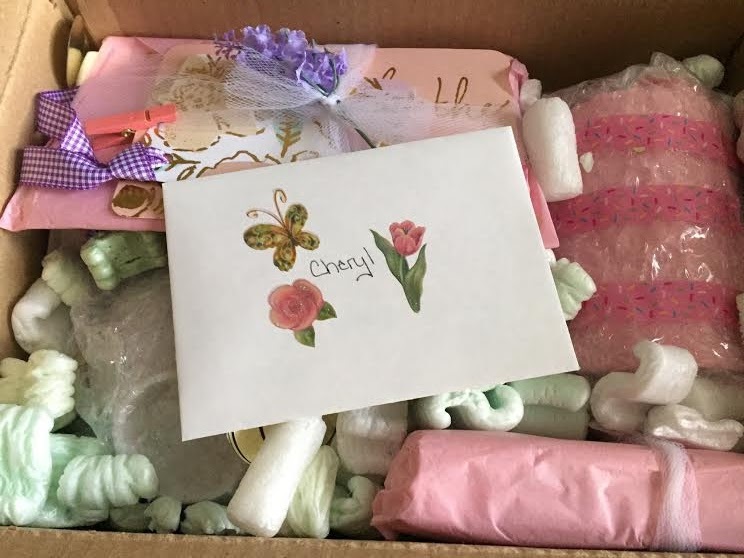 A beautiful gift with lovely wrappings sent at an opportune time to allow the Lord to pour out His love upon you, Cheryl. Everything is beautiful and I know the exciting feeling of a precious gift mug filled with coffee or tea and praying for the sender! A friend gave me a gift bag with a beautiful mug just for fun and I pray for her every time I use it! I truly hope each day is a healthier one for you, my friend. Dear Cheryl, I was grinning from ear to ear reading this lovely post! Your enthusiasm and description showcased how much you were blessed that it blessed me!!! Oh what a thoughtful, precious friend and gift. Every single detail lovingly picked out with you in mind. What treasures you received. I always say, it is the thought that matters most. And you can see that you are highly thought of. Rejoicing with you at the most timely encouragement you received from a dear friend. Oh, that is wonderful!!! I am so thankful it brought a big smile to your face, sweet friend! I am so grateful to you for your support, encouragement, prayers, and precious friendship. May the Lord bless you abundantly! Sending much love to you today, dear Karen! How very beautiful everything is. 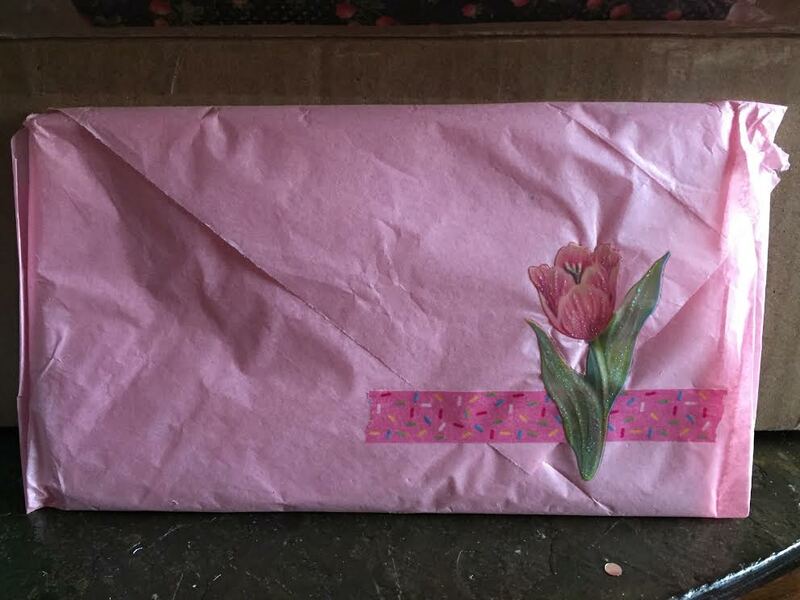 You took such care in showing us all the lovely details of your package. Enjoy all the wonderful delights! Beautiful Cheryl. Stephanie chose many wonderful goodies for you and handcrafted some sweet crafts. Everything looks perfect for you. I hope you're feeling better. Have a wonderful weekend! She surely did a great job, didn't she? You would think she could read my mind and know exactly what I would love! What a gem dear Stephanie is!! I know you know that first-hand, though. :) God bless you, dear Kelly! It always brightens my day when you stop by! What an honour to receive such a wonderful package of goodies from sweet Stephanie. Her exchanges are always such a joy to participate in. I may have to borrow some of her wrapping ideas. Hee! Oh, I am sure she won't mind! She is SO creative and just thinks of everything...those small touches mean the world, don't they? I know you are a big blessing to many others, too...I can just feel it! God bless you, sweet Margie! What a fantastic gift.. The wrappings were too pretty to open.smile. Love the cup. loved it all. gorgeous!!! I have been seeing several people involved in the tea cup exchange.How fun.. Thank you so much, sweet friend! I was so blessed by Stephanie's generosity and love. I hope you can participate in the exchange sometime! It is such a dear blessing! Thank you for your visit and kind words. God bless you! You have certainly been blessed by a lovely lady. So very true, Donna. God bless you! It just blesses my heart to see you so happy & blessed with you gifts. Your friend is special to send that! That's the best swap box I have ever seen. It seems all so fun! Enjoy your blessings sweet lady! She surely is!! Thank you so much for your kind words! I think it was the very best swap box I have ever seen, too. :) So thoughtful and generous. God bless you, my friend! Wow, Cheryl! What a great package. :-) And, how nice to have Stephanie send to you this time. It surely was such a nice surprise! Oh, I feel SO bad that I still have not written you back! Please do forgive me, and I hope you won't give up on me! I just have not had time yet, but, Lord willing, hope to write to you one of these days! God bless you, Mary!! What a lovely, generous gift! Enjoy my friend! Thank you, dear friend! I am praying much for you. :) Sending love and hugs your way!